One of the main goals of the Free Omar Khadr Now-campaign is to hold the media accountable for proper coverage of all aspects of Omar’s case. While there has been significant improvement in the way the mainstream media covers the story, misinformation, inaccuracies and lies continue to be printed! Misinformation, inaccuracies and lies continue to be printed by the mainstram media in their covering of the Omar Khadr story. Their legally and factually wrong reporting is dangerously misleading. Mr. Khadr cannot reasonably (or legally) be considered to have ‘admitted’ to the U.S. accusations against him. In October 2010 Mr. Khadr had been arbitrarily (i.e. without legal justification and without access to judicial oversight to determine the illegality of his detention or his treatment) for over 8 years. Throughout that 8+ year period Mr. Khadr was subjected to a variety of torture and other cruel, inhumane and degrading punishment and treatment, first at the notorious Bagram prison and then at the extra-legal Guantanamo Bay prisons. His treatment throughout is prohibited by U.S., Canadian and international law binding on the U.S. and Canada. In advance of his October 2010 scheduled appearance before the Guantanamo Bay tribunal, it was known by all that this process –the Gitmo tribunal– would not result in Mr. Khadr gaining his freedom. In August 2010, the White House had issued a public statement confirming the U.S. intention to continue to hold Guantanamo Bay prisoners indefinitely, irrespective of a finding of not guilty by the Guantanamo Bay tribunals. Mr. Khadr’s acceptance in October 2010 of the ‘get out of jail in eight years and go back to Canada in one year’ plea bargain offered by the U.S. would not be considered by any properly constituted court in Canada as an ‘admission’ that could be used or relied upon, to establish guilt. Having been obtained by torture and other impermissible coercion, Mr. Khadr’s acceptance of the plea bargain is not and cannot be considered, an admission of guilt. This is a principle of law well understood by the public. The mainstream media’s insistence on referring to Omar Khadr as a convicted murderer invites listeners/readers to assume that the media knows of factors unknown to listeners/readers, that render the wholly illegal capture, detention, treatment and extraction of statements through the use of torture, the charging and ‘conviction’ of Omar Khadr, as somehow (exceptionally) legal and justified. For several years, Canadian mainstream media has persisted in parroting the erroneous pronouncements of the very governments implicated in the horrific and illegal maltreatment of Omar Khadr. …. Mr. Khadr was not tried in anything resembling a normal, First World legal process. He pleaded guilty under duress: He faced indefinite incarceration without trial unless he pled guilty. The crimes themselves were invented retroactively. The court did not follow normal American domestic or military law, and it denied standard legal protections to the accused, who was a child when he was captured. What hypocritical blather from two federal puppets. First, from federal lawyer Bruce Hughson in opposing Omar Khadr’s bail application: “It’s critically important that Canada meet its international obligations” — you mean, by recognizing Khadr’s clear status as a “child soldier” under the UN protocol originally championed by Canada? Or, by formally condemning — it never has — the perversion of international law through torture, abuse and other crimes at Guantanamo, in whose tenure, by way specifically of our off-loading of Khadr, Canada is complicit? 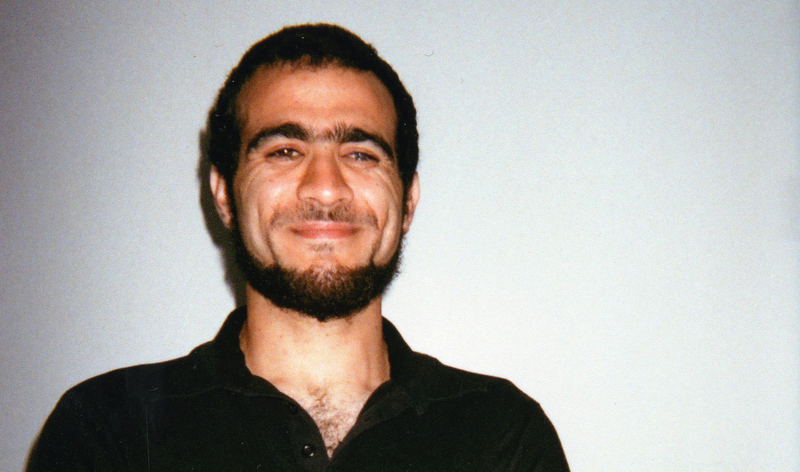 Second, from Jeremy Laurin (Minister Steven Blaney’s press conduit): “Omar Khadr pleaded guilty to heinous crimes . . .” — any criminal lawyer with a pulse understands the plea was made to avoid Khadr spending his entire life in either Guantanamo or a U.S. prison. No allegations were ever proven by trial and tested evidence, and there is no legitimate international law providing a charge of “murder” against a soldier in any armed conflict defending himself against an enemy assault. All stories on the Edmonton Journal’s website that carried news about Omar Khadr’s bail hearing included in the headline “convicted terrorist.” That phrase, so emotionally charged and misleading, should have had a huge asterisk beside it. Omar Khadr was put before a military tribunal that was outside the American legal system and Geneva Conventions. The main evidence against him was a confession obtained through torture and illegal interrogation methods. It’s time to use another headline. 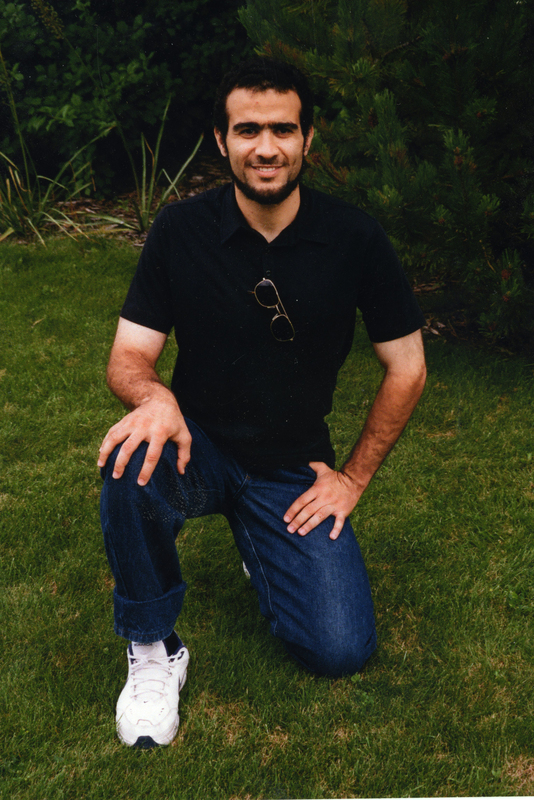 … Khadr, in blue jeans and a white polo, sat in a box off to the side. He could spot the orange ribbons and friendly faces in the courtroom, thanks to corrective eye surgery last month, repairing his right eye from the shrapnel that blinded his other eye. So when they smiled and waved, he was able to smile and wave back. SORRY, TICKETS NO LONGER AVAILABLE – SOLD OUT. Attention Free Omar supporters in B.C.’s lower mainland: An opportunity to meet Dennis Edney, lawyer for Omar Khadr, share a meal and help cover Omar’s upcoming legal costs. Wednesday April 8th 6:30 p.m. Tamam Restaurant 2616 E Hastings St. Vancouver, B.C. $45 (pay at the door) Limited seating so be sure to contact freeomar.ca@gmail.com for reservations. On the morning of Tuesday, March 24, Omar will be back in court at the Court of Queen’s Bench Alberta. His lawyers will present arguments that, if successful, will lead to his release on bail pending the result of the appeal in the United States of his Guantanamo Military Commission conviction. Public and media interest will be very high and we hope to clearly communicate to Canadians that Omar has strong support within the community from a diverse group of Edmontonians. Please join us at the courthouse on Tuesday morning to get that message across! 08:30 – Assemble at the Three Bananas Café on Churchill Square. We will have Orange Ribbons available for all to show solidarity. 08:55 – Process as a group to the Court of Queen’s Bench. 09:00 – Brief assembly in front of the Court. This is the key media moment. 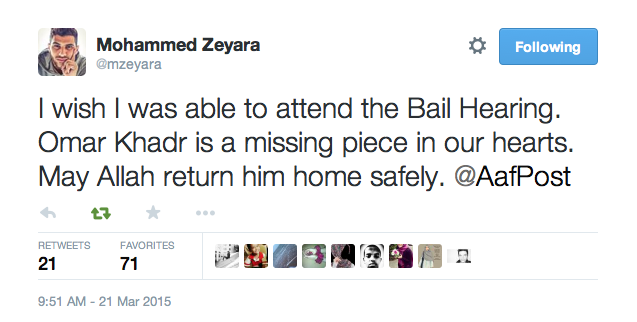 10:00 – Expected time for the bail hearing to begin. Courtroom # to be determined. 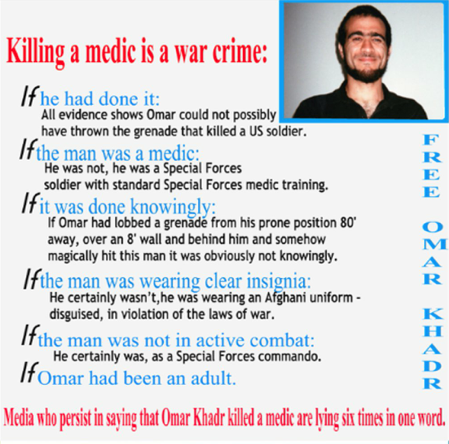 Omar deserves true justice. None of us would be content to have our family members subjected to the injustices that are inherent in the Guantanamo Military Commissions that ‘convicted’ Omar. Omar is welcome here. We are here to let Edmontonians know that there are many reasonable, intelligent people here today who know Omar personally; all are convinced that he will make a very valuable contribution to our community. Please confirm your attendance [via this link] so we can plan to have enough Orange Ribbons ready AND so we can advise the court if an overflow crowd is expected. On March 10th, 2015, LGen Romeo Dallaire gave a talk in Halifax titled “Ending the Use of Children as Weapons of War: General Dallaire’s Ultimate Mission”. Before the event the organizers reached out to youth and individuals on Facebook to submit questions of which 3 would be posed to LGen Dallaire. On the issue of Omar Khadr, we have been very divided over his case as a country, with some stating he is a child soldier and others stating he is a criminal. The overall issue of how Canada goes forward both legislatively and judicially to determine how to handle cases like Omar Khadr’s is an area that deserves to be in discussion. What legislation and legal mechanisms would you like to see Canada put in place to deal with cases such as Omar Khadr’s? Canada has “fallen into lawlessness,” says Omar Khadr’s lawyer. And we are all culpable. Canadian – as if this were not bad enough. It is also an abuse of our collective rights – and the foundations of our society. Omar Khadr was imprisoned in Guantanamo Bay at fifteen years old. He spent a decade in Guantanamo before facing the US Military Commission’s spurious kangaroo court process, which allowed evidence obtained under torture and retroactively applied crimes, thus failing the most basic tests of a fair court. The charges themselves were not legally recognized war crimes, but rather were crimes invented by the US government. Yet Canada continues to imprison Khadr based on this process. Speaking to a full house of students, faculty and members of the public, Edney made an entreaty for Canadians to speak up against the erosion of the rule of law in this country. He spoke, he said, not only as a lawyer, but as a father who had been profoundly changed by what he witnessed at Guantanamo. Omar Khadr is a native of Toronto and was in Afghanistan with his family in 2002, aged fifteen, when the compound he had been left at by his father was attacked by US forces. Omar was severely wounded in the air bombardment, riddled with shrapnel and blinded in one eye. While he was in this condition, a US Special Forces soldier shot him twice in the back – a war crime in itself under the Geneva Conventions. Within days of being shot, while still in critical condition and bleeding from gaping bullet wounds in his chest, he was subject to torture by US military personnel. It was at this point he was accused of having killed an American soldier. Interrogators tied him in painful stress positions to aggravate his wounds, hung him by his wrists for hours on end, and subjected him to a litany of other cruel, degrading, and inhumane treatment. Omar’s torture is now a matter of public record, Edney pointed out on Wednesday, citing legal documents such as Omar’s affidavit, the testimony of Omar’s interrogators themselves and of other prisoners held with him. Omar’s chief interrogator, Sgt. Joshua Claus, later pled guilty to crippling two prisoners and murdering two others who died after his interrogations. Edney described that in his own personal interviews with Claus, the man confessed that he had never been harder on anyone than he was on Omar. It is under these conditions that Omar made his “confession.” This was the only evidence against him, and to this day he is still imprisoned in Canada based on it. Omar’s decade of imprisonment and torture in Guantanamo was illegal under international and Canadian laws, but was allowed to continue by the Canadian government. The first duty of a government is to the safety of its citizens, and especially its children. But instead of providing consular assistance and requesting his repatriation, as did all other Western democracies for their citizens at “Gitmo,” the Canadian government actively took advantage of Omar’s situation to contribute to his further torture and indefinite detention. Had he not signed, according to the Pentagon, even if the commission ruled him innocent he could still have faced a lifetime of imprisonment at Guantanamo. Make no mistake that the Canadian government knows all the details of Khadr’s torture and abuses, Edney says. The Supreme Court of Canada has agreed. On the two occasions it’s seen the case, in 2008, and again in 2010, it ruled that the Canadian Government was complicit in the violations of Omar’s Geneva and Charter rights. Yet Omar remains imprisoned. Since coming to Canada, he has spent months in solitary confinement, or in danger from the prisoners around him thanks to having been classified a maximum security risk by the Canadian government, against the advice of American officials. He has not had access to the medical care he needs, and is currently losing the vision in his remaining eye. All this speaks to the abandoning of fundamental principles of justice that have been in place since the 1700s – the right to habeas corpus, to escape guilt and fear by association – as well as principles enshrined in the Geneva conventions, the declaration of human rights, and the declaration on the rights of the child. It is this that Mr. Edney referred to in decrying the failure of the rule of law in this country. “There is no greater betrayal of Canada than for our government to be implicated in the torture of a Canadian citizen,” Edney said. He placed the burden on all Canadians for failing to make their government take responsibility. His talk could have been called “the evils of apathy,” he said, urging the audience to speak up about the injustices and not to settle for a society that makes decisions based on fear. Edney continued that if this can happen to one young boy, who should have been guaranteed all sorts of protections, protections as a citizen, and child, it can happen to any of us. The rule of law must be applied to everyone or it means nothing. This is the foundation of our society. And if the rule of law means nothing, none of us are safe. 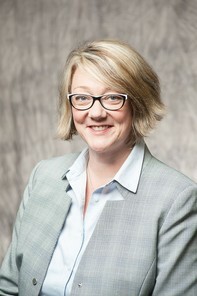 “We seek to serve community and society to bring about reconcilation,” university president Melanie Humphries tells As It Happens guest host Laura Lynch. “We really feel that society increasingly has become about retribution and fear.” She adds that about 30 per cent of the university’s students don’t identify as Christian. Humphries, who has spent time with Khadr, says he has been wrongly portrayed in the media — and by the federal government — as a terrorist and a jihadist. “My impression of him is that he’s an articulate, thoughtful, non-radicalized individual,” she says. 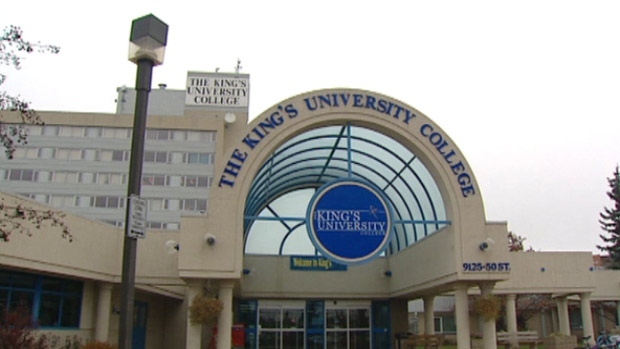 King’s University in Edmonton says offering Omar Khadr admission is the right thing to do. The Christian-principled school is giving the former Guantanamo Bay inmate a spot as part of his bail application to be heard next month. “This completely matches what we’re about: Our mission is about inspiring and educating learners to be agents of reconciliation and renewal,” Dan VanKeeken, the school’s vice-president, said in an interview in Toronto this week. Khadr, 28, pleaded guilty in 2010 before a widely maligned U.S. military commission to five war crimes he was accused of committing as a 15-year-old in Afghanistan in July 2002. 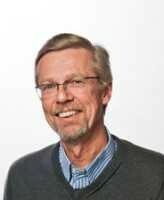 He is now serving out the rest of his eight-year sentence in Bowden, Alta,. as a medium security prisoner. He is applying for bail — to be heard in March — pending an appeal of his conviction based on U.S. legal rulings that what he did was not a war crime under either international or American law. A Christian university in Edmonton has offered to admit former Guantanamo detainee Omar Khadr if he wins his bid for freedom next month after 12 years in custody. “What better way to prepare someone for success in life than with education,” said Dan Vankeeken, vice-president of The King’s University, in an interview Tuesday as he visited Toronto. Although the Khadr case has been highly politicized and has divided Canadians, Vankeeken says the university’s decision has been well received by the community. Khadr’s Canadian lawyer Dennis Edney said the Toronto-born Khadr would live with him in Edmonton. Khadr’s bail hearing is set for March 24. It will be his first attempt at freedom since his return from a notorious U.S. Prison in Cuba where he was held for eight years. “It’s becoming clearer and clearer in the United States from recent cases that Omar’s convictions are invalid,” his lawyer, Nate Whitling, told the Canadian Press last week. Omar Khadr will be offered a place at King’s University as a mature student and he will receive help from several agencies and citizens to integrate into the community, according documents filed in court Friday for a bail hearing. In his affidavit, Khadr, 28, sets out his hopes to stay Edmonton, study at King’s, join an interfaith community and play some pickup games of soccer in the neighbourhood if he is released on bail this spring. TORONTO – Former Guantanamo Bay inmate Omar Khadr is seeking bail pending disposition of his appeal in the United States against his disputed conviction for war crimes. The bail hearing, set for March 24, would be Khadr’s first attempt at freedom since his return from a notorious U.S. prison in Cuba where he was held for eight years. By Aaf Post  Posted in Omar Khadr	 Tagged Canada, cdnpoli, child soldier, Dennis Edney, Edmonton, Free Omar Khadr Now, Geneva Convention, Guantanamo, Human Rights, injustice, international law, Islamophobia, Khadr, Kings University, military court, military tribunal, Omar Khadr, peace, torture, United Nations, war crime by U.S.